Ruchir Sharma predict what to expect from the economy and politics of India and the world in 2019. 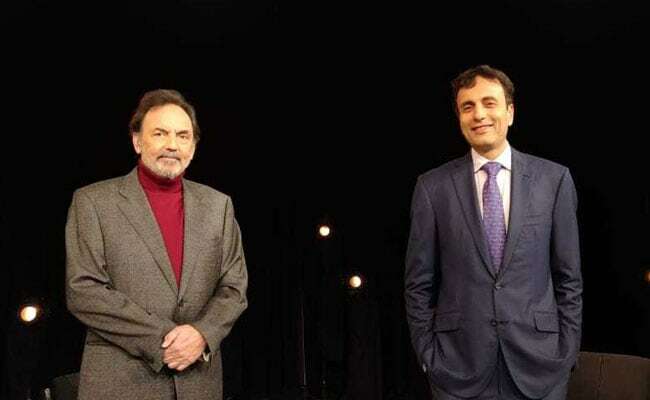 Ruchir Sharma (right) spoke to NDTV's Prannoy Roy. 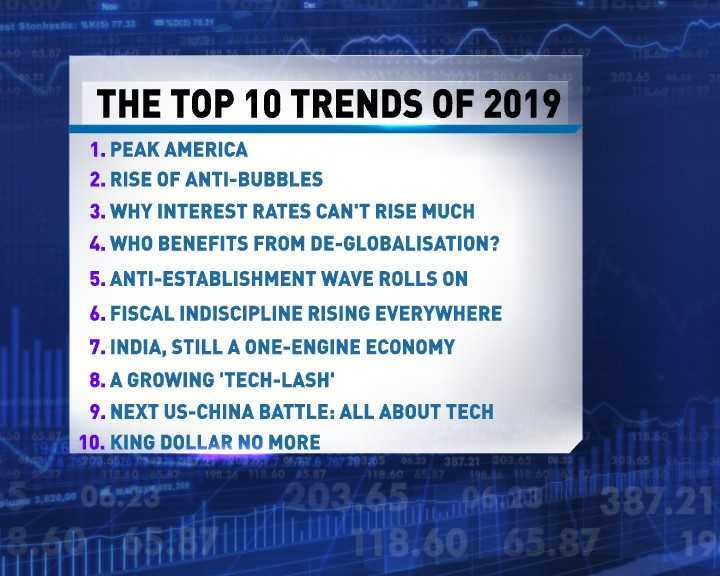 Author and global investor Ruchir Sharma spoke to NDTV's Prannoy Roy on the top economic and political trends of 2019. What should you invest in this year, what not to invest in, what should you do with your savings, will interest rates go up or down, should you be cautious in 2019 or can you go a little wild? Ruchir Sharma answers these questions and more. 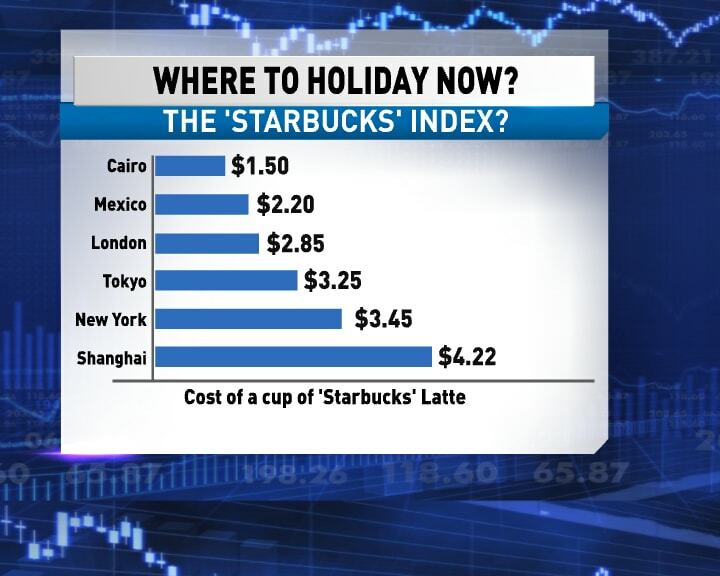 As a bonus, Ruchir Sharma explains that the cost of a Starbucks latte should influence your next holiday decision. 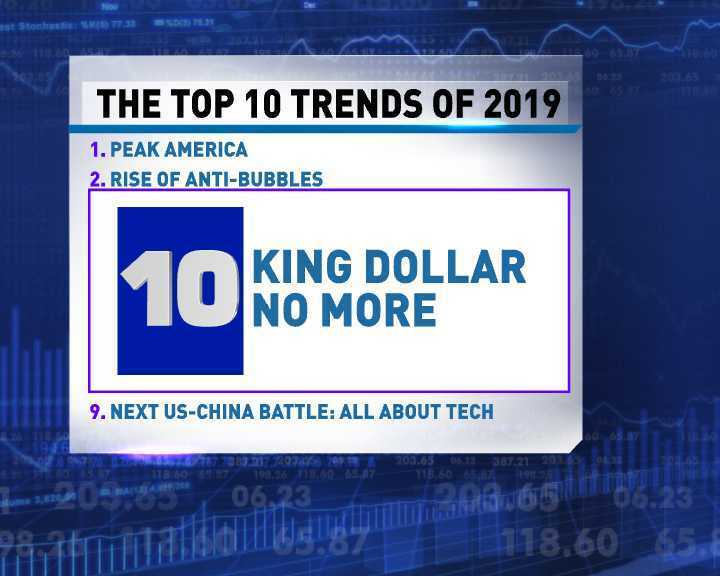 And the last point is that the dollar is not king any more. In other words. the dollar has been so strong that it's kind of peaking. "Post 1973, ever since we have been in this feely, floaty exchange rates, the dollar has really moved in a band," Ruchir Sharma says. 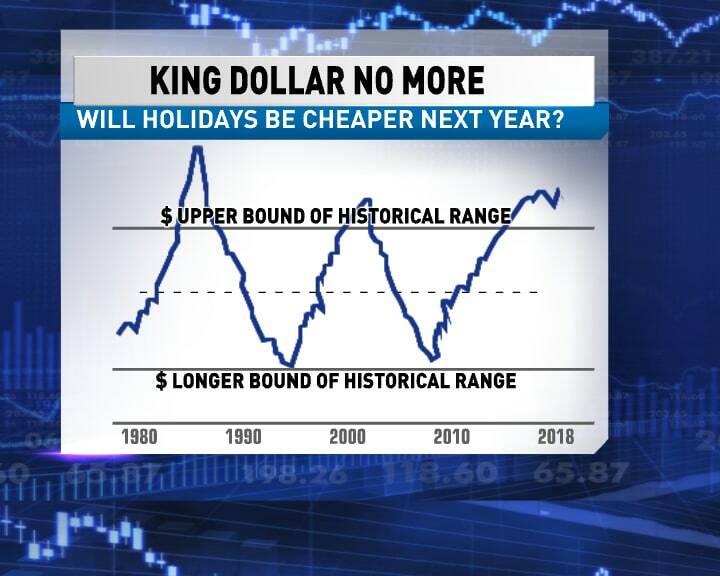 Every time the dollar hits the peak, the upper band breaks it, it comes plummeting down again. So based on past evidence, its likely to drop again once it passes the band. "This could in general be good for India and other emerging economies that typically if we have a weaker dollar, we tend to do more and more money comes into our country and so that sort of helps. On the other hand, when you have a strong dollar, that means a lot of money gets sucked out of the country. So generally a weaker dollar is better," Ruchir Sharma says. "That is something that I would have not expected given the fact that how closed that system is for China to produce these amazing tech companies," Ruchir Sharma says. 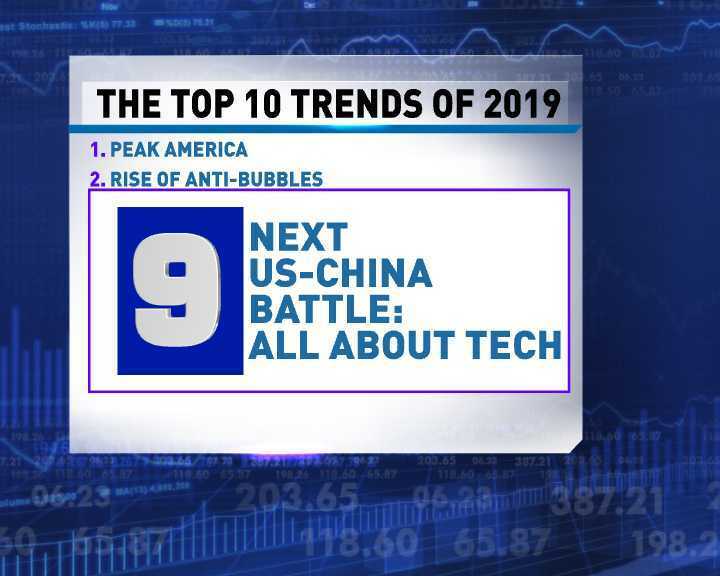 Trend number 9, is the next US-China battle and its all about tech. 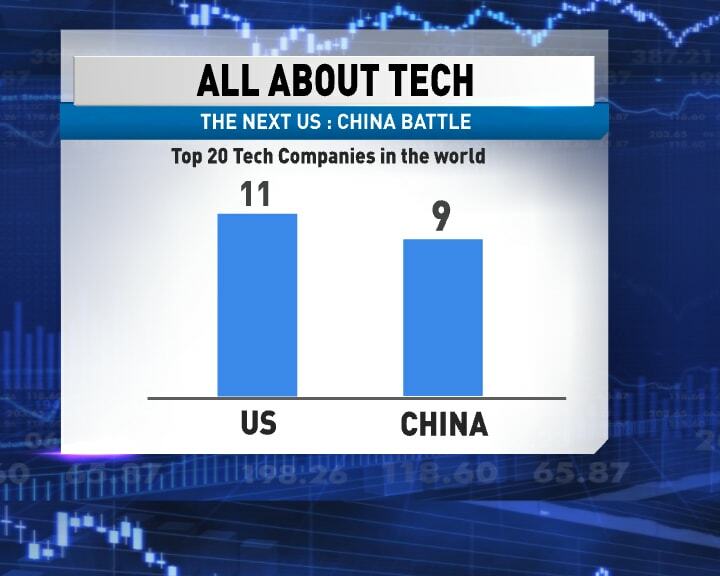 Of the top 20 tech companies in the world, 11 are in America, and 9 are in China. 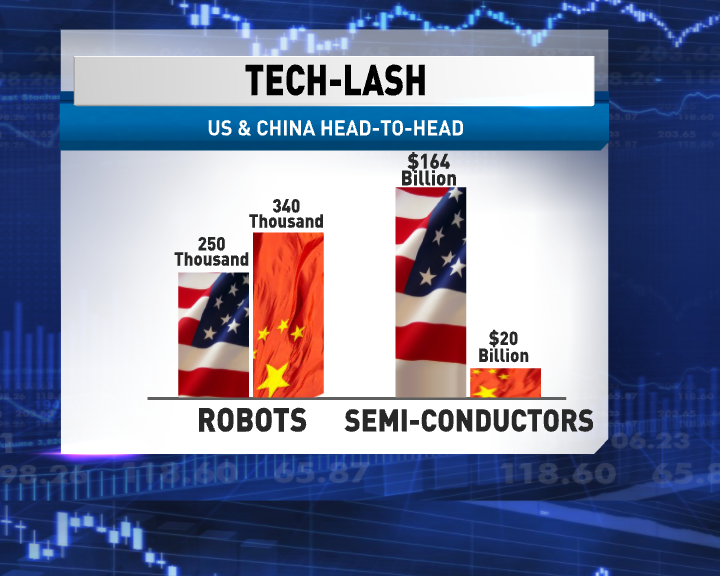 China has 340,000 robots and US has 250,000. 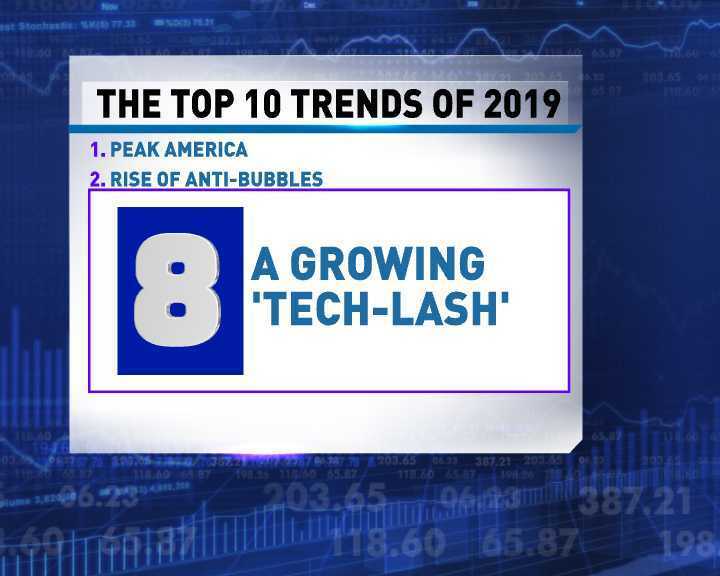 The next trend of 2019 is something Ruchir Sharma calls a "tech-lash". Technology has been least-regulated part of any economy, especially the American economy, and a backlash has begun there and is happening all over the world. All the other sectors of economy are saying how come they get away with it? 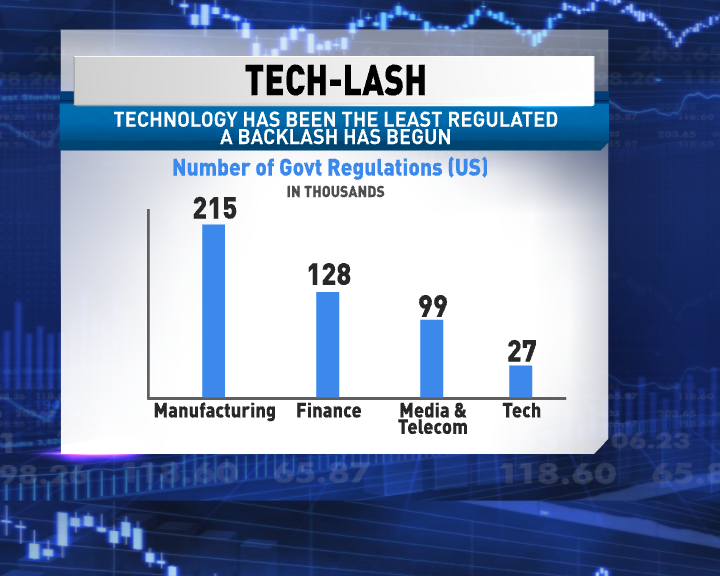 The number of government regulations in US in manufacturing sector is 215,000 regulations and technology has just 27,000. 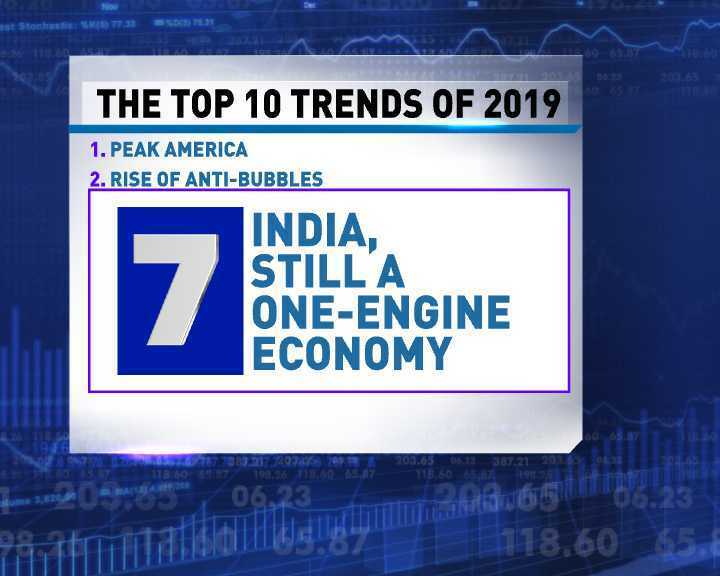 Number 7 is what Ruchir Sharma calls a one-engine economy. 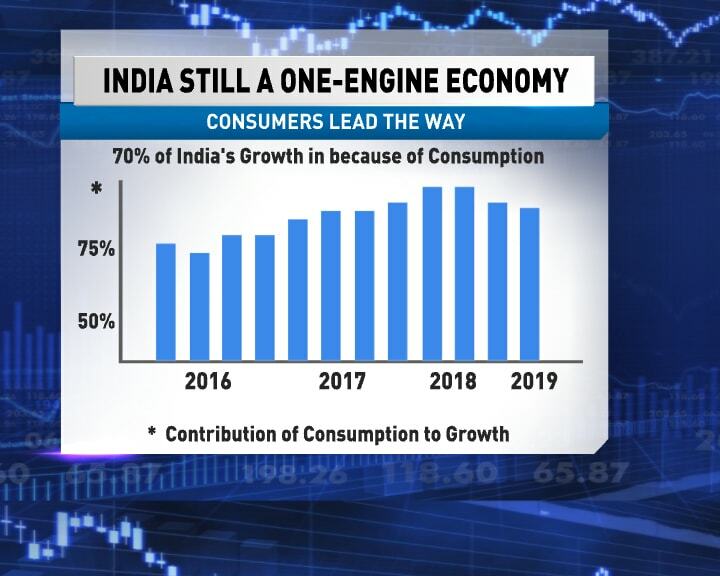 India is still a one engine economy in the sense that consumers alone lead the way. In China, there is a lot of investment, capital formation, infrastructure but in India its all consumerism. 70% of India's growth on average is because of consumption. "Based on consumption alone it is very hard to grow at the rates that we want to which is 8% plus," Ruchir Sharma says. Another point that he sees is that all this consumerism is increasingly based on debt. "Thankfully it is happening from the low base - which means that household debt isn't that high but it is a bit concerning that a lot of the increase that has taken place in the consumption in the last few years has not been so much based on just income but the fact that people have taken much more debt," Ruchir Sharma says. Figures show that 80% of Maruti cars are financed by debt not by people paying for them up front. "Number of people who are using that (debt) to buy a car has gone up considerably over the past few years," he says. 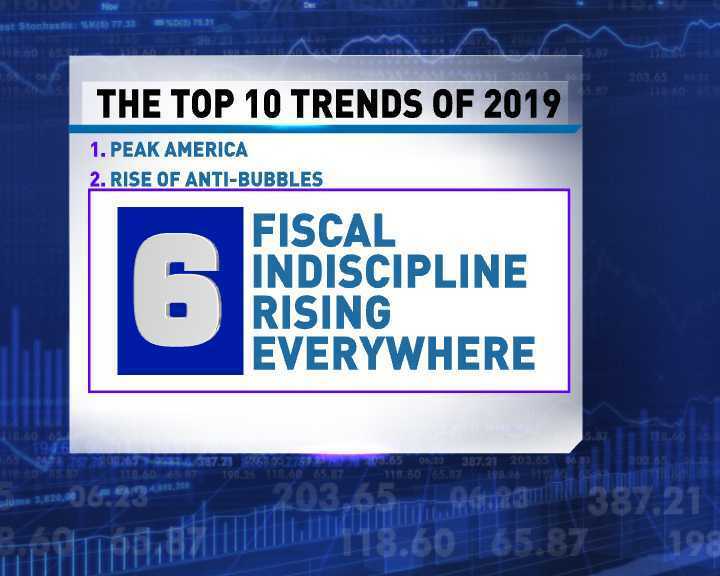 Trend number 6 is fiscal indiscipline rising everywhere. The percentage was just 2.25% and has gone up to 3% average. Now, that kind of increase that is .75 on 2.25 - that's a lot. What it means is that votes for populists and right-wing and left-wing parties has gone sharply up. It did go up just before the Second World War with the Nazi movement and then it has been more or less flat - around 10% of the vote - but it's just gone shooting up again and the votes are as high now as they were in 1939-1940. 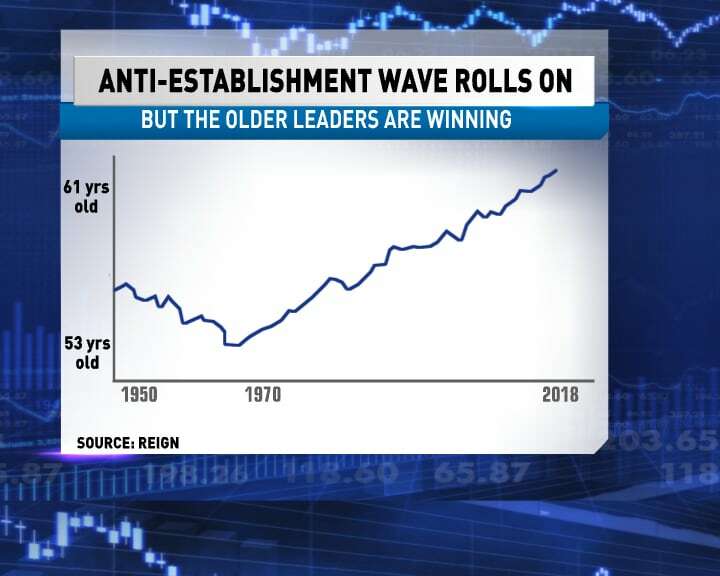 However, despite this anti-establishment wave, the kind of leaders that have come to power, have been much older. Average age of leaders used to be 53 years old and now it has gone up to 61 years old. Who gains from China-US tensions? So why is protectionism on the rise? "It's a backlash. 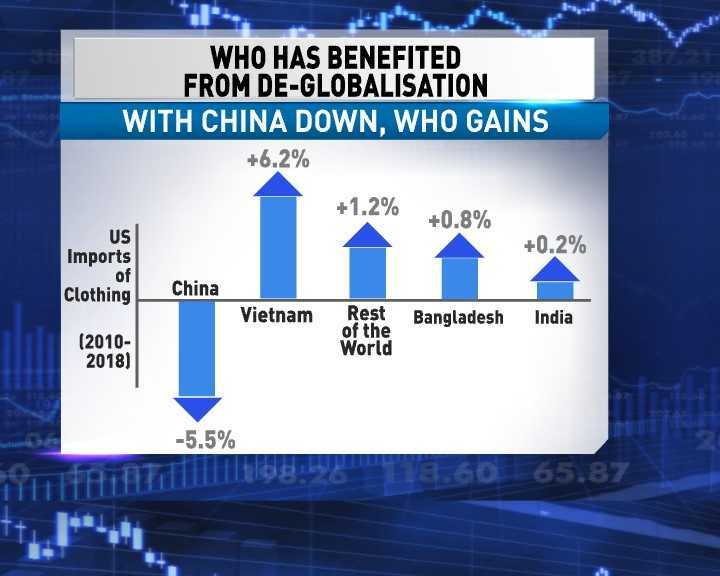 As the graph shows, because there's a massive increase in globalisation. 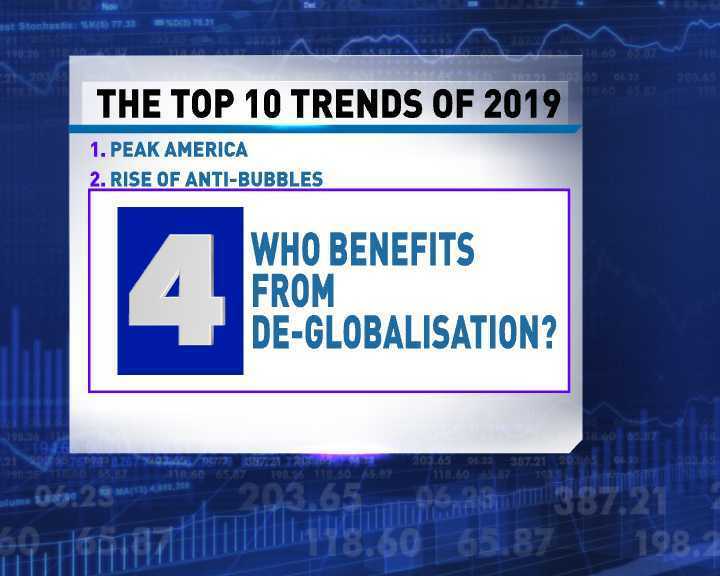 There is some people who haven't benefited from this massive increase in globalisation and when a pendulum swings too aggressively in one way, you do get some sort of swing back," Ruchir Sharma says. "Because of the backlash, because some people think they have been left out of this big sort of boom that has taken place. So that backlash has been going on ever since financial crisis hit us in 2008. 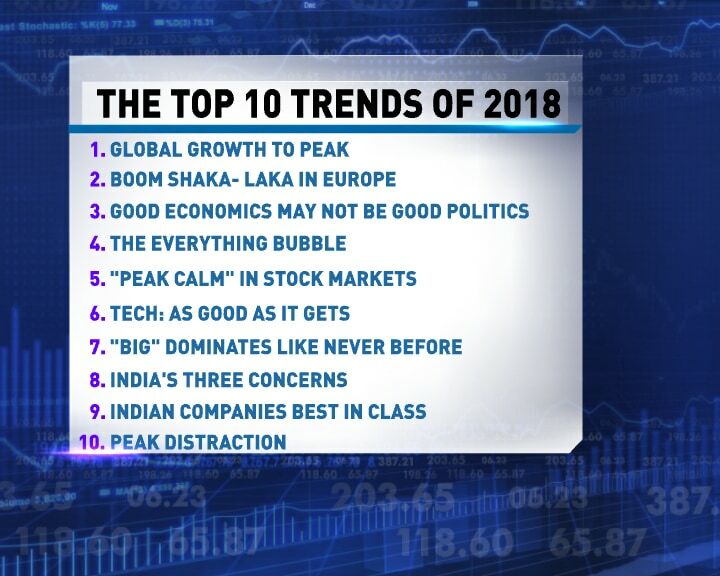 Trend number 4 in top 10 trends of 2018: Who benefits from this current amazing round of de-globalisation. Trade as a percent of GDP has changed. It used to be 30%, hit 60% - and now it has started falling off. One of the reasons for this is of course the US China stand-off. 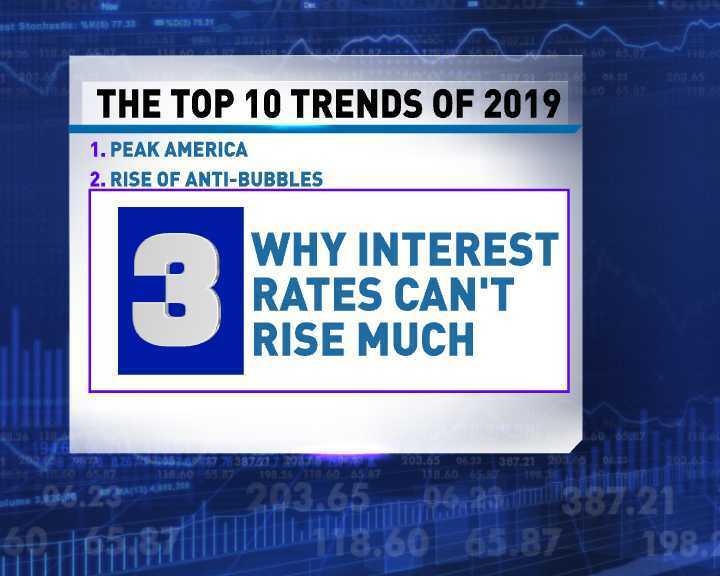 The third in the top 10 trends of 2018: Why interest rates can't rise much. For people who have got home loans or paying back loans of various types, this comes as bit of a good news. Ruchir Sharma says interest rates can't rise because there is already too much global debt and the impact is now becoming really serious. Just 10 years ago, global debt was twice as global GDP. Now, it's more than 3 times global GDP. "In general, I think you know the bubble is mainly in the US and the anti-bubbles are spread around the world. Some of them are more extreme as we pointed out like Eastern Europe or South-East Asia and then you also have countries like India which have been overshadowed by the rise of these tech companies," Ruchir Sharma says. "A decade ago, India which was dominating and some of these companies hadn't even been conceived. You hadn't even heard of them, they were being neglected like the likes of Netflix and Amazon. Their business models were being questioned and then they boomed and then countries like India and Indonesia, they did poorly. So, I think we could once again be setting up for a role reversal in the coming few years," Ruchir Sharma says. If you looked at India in this context as well - even India was eclipsed by the FANG companies - Facebook, Amazon, Apple, Netflix and Google. "The trading volume in all these countries put together which is Indonesia, Malaysia, Philippines, is less than a billion dollars a day even though their size is sort of comparable if you take the market value of those countries as your graph shows compared to Apple," Ruchir Sharma says. "The market value of Apple and Amazon and some of these tech companies have become so large that it was dwarfing some of these other countries with pretty decent economic fundamentals," Ruchir Sharma says. 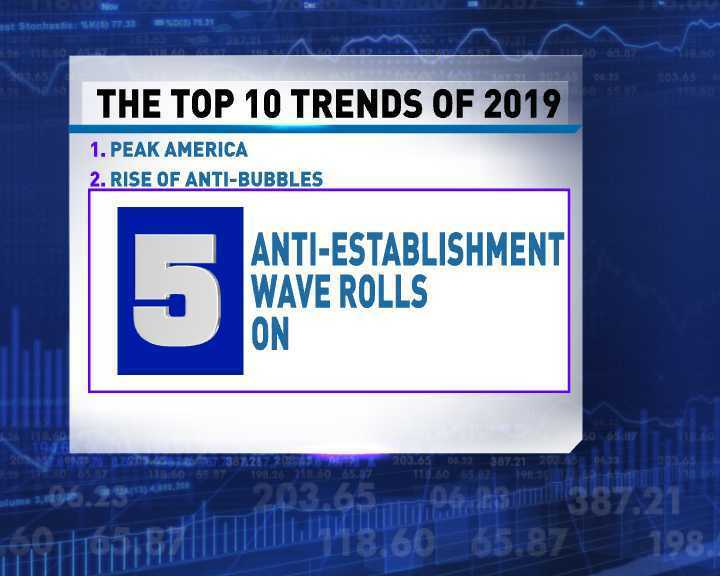 "These are companies that are doing pretty well but all because they don't fit the hype and the hype of the last decade has been all about America and all about technology," he says. 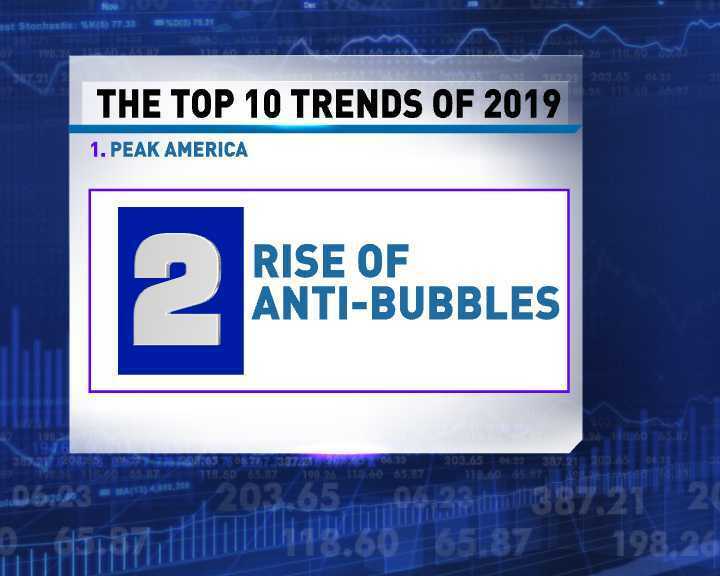 Let's have a look at trend number 2: the rise of anti bubbles. These are particular areas that are not being focused on. "The American stock market has done so well compared to the rest of the world that the stock market today is at a 100 year high relative to other countries," says Ruchir Sharma. "This tells you how well America has done in the past decade but now I think as interest rates in American are going up, the fact that the American economy today is already in the midst of its second longest economic expansion in history. "And if the American economy continues to grow to middle of 2019, it will become the longest economic expansion in its entire history. "It has been a great streak. First we have to acknowledge that but there are signs that this is beginning to fray. "A lot of excesses are beginning to build up out here, there is too much corporate debt in America. The fact that the American stock market compared to the rest of the world is much more expensive, the fact that the US dollar is so expensive which is beginning to hurt its exports and also its manufacturing sector. So I think there is a natural feedback mechanism and that is what I am concerned about," he says. "If you look at the American stock market for one, this decade has basically tripled in value," Ruchir Sharma says. "And it has tripled in value at a time where rest of the world stock markets have, including India in dollar terms, have practically done nothing," he says. "I think there has to be some recognition here that there is so much first talk of American declinism and we heard so much of that a decade ago that counter to that conventional wisdom, America has done really well. "In fact, today the American economy is about 25% of the global economy but the American stock market is about 55% of the global stock market value - the gap is 30% points. That shows how well the American stock market has done. "The US has never been as powerful as it has been today in terms of the use of the US dollars: how strong the US dollar is, how strong the American stock market had been until the decline began last October compared to the rest of the world and just in general about how American finance has dominated the world over the last decade. "My point here is the fact that each boom sows the seed of its own decline. Once a boom gets sort of really wild, a lot of complacency sets in. Lots of excesses get built up and then something else comes in and fills in the gap until they recover and get back to the drawing board and clean the excesses out," he says. 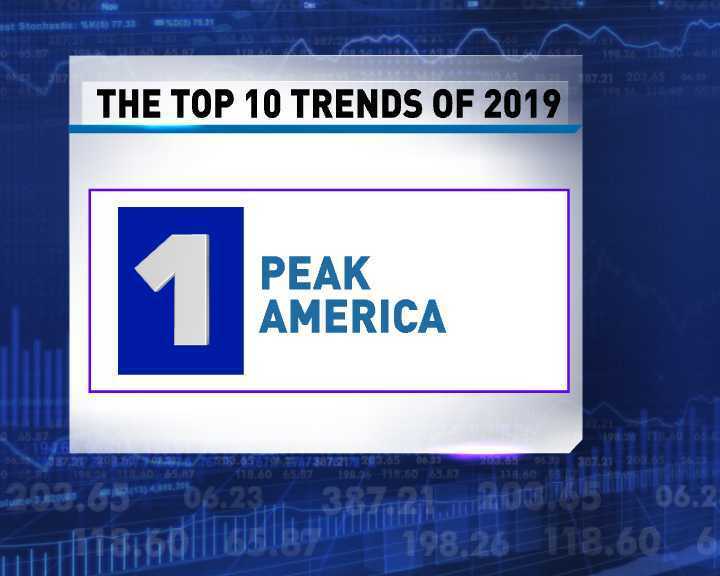 Ruchir Sharma says that the first one is "Peak America". That means America will have peaked and will decline this year. Now, for the the top trends in 2019. So if you were keeping count, that's 9 out of 10 predictions gone right: a 90% score. "I think,that there is a law of diminishing returns to the use of technology and of smartphones and other sort of gadgets around you," Ruchir Sharma says. "It has undoubtedly led to a big productivity boom in the last decade as these things have sprouted but also we have hit a tipping point... that if you use too much of it, it will have negative returns for you," he says. "I think that there is much greater consciousness now about what should we do to try and limit the amount of time that we spend on these devices if it begins to hurt our relationships, if it begins to hurt our productivity in general," he says. "So, I think that is something that we are likely to see much more. Digital detox is the new phrase or the new buzz word for many people now," he says. Ruchir Sharma says that Apple was almost forced to come out with new digital wellness features just to counter this image of screens being negative and negatively affecting all of us, distracting all of us. China had a crackdown on children using video games and interestingly Cambridge Dictionary's word of the year was "Nomophobia" meaning "a fear or worry at the idea of being without your mobile phone or unable to use it". Point number 10 in the top 10 trends of 2018 was: distractions. That is the distraction that we all have by mobile phones, tablets and how bad that was and was anything being done about it. "Last year, nothing really worked so the average Indian company did very poorly in terms of the returns that they gave. The small-to-mid sized companies did poorly," Ruchir Sharma says. "But yeah, 2018 was say not a great advertisement for I would say how well Indian companies do because of the poor returns that the average stock generated in India," he says. 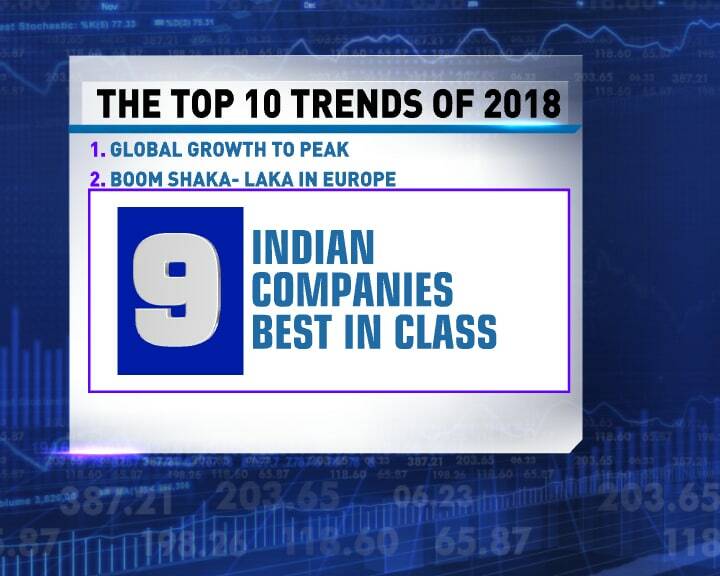 Number 9 on the trends Ruchir Sharma predicted was that Indian companies would be best in class in terms of the returns they give to the economy, return on investment and return on capital. "I think what I was saying was the fact that we were likely to see some deterioration in India's main macroeconomic indicators. I was speaking about the current account deficit, I was speaking about the fiscal deficit, also what was going to happen to our core inflation rate and broadly in 2018 these concerns were ramped u," Ruchir Sharma says. "Luckily, at the end of 2018, some of these concerns to do with inflation are beginning to end but the big theme in 2018 was that these macroeconomic concerns really came to the fore and was one of the main reasons why the rupee fell a bit in 2018 because these concerns were there and some of these concerns linger as we get into 2019 as well," he says. Point 8 in the top trends of 2018 was that India had 3 major concerns: current-account deficit, fiscal deficit and co-inflation rate. "Big companies, their market shares in each sector whether with household consumer goods, passenger vehicles, televisions, if you look at all these sort of categories across the world what we are seeing is that anywhere, in India, these are the top companies keep gaining more and more market share almost at the cost of the small and medium sized companies," Ruchir Sharma says. 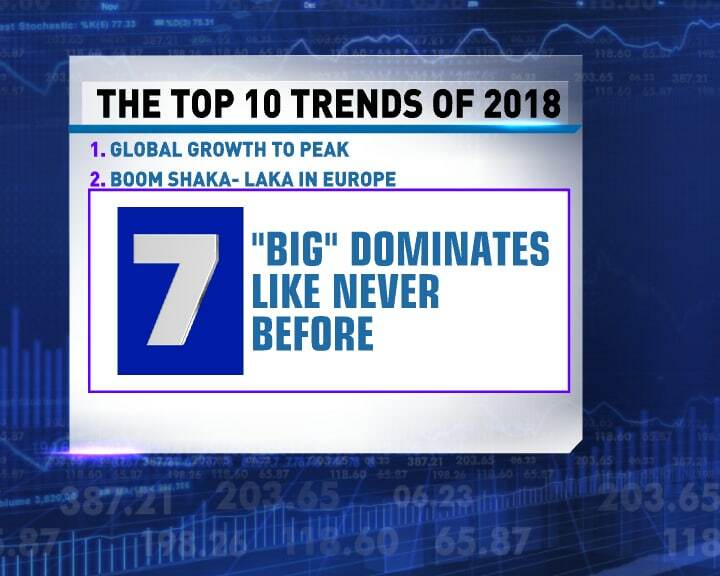 For number 7, Ruchir Sharma said big companies will dominate their sectors like never before. "It's a year when finally the shine came off stocks like Facebook, Amazon," Ruchir Sharma says. Tech stocks plunged by 25 per cent, towards the end of 2018, data shows. That really came as a shocker to the rest of the world. 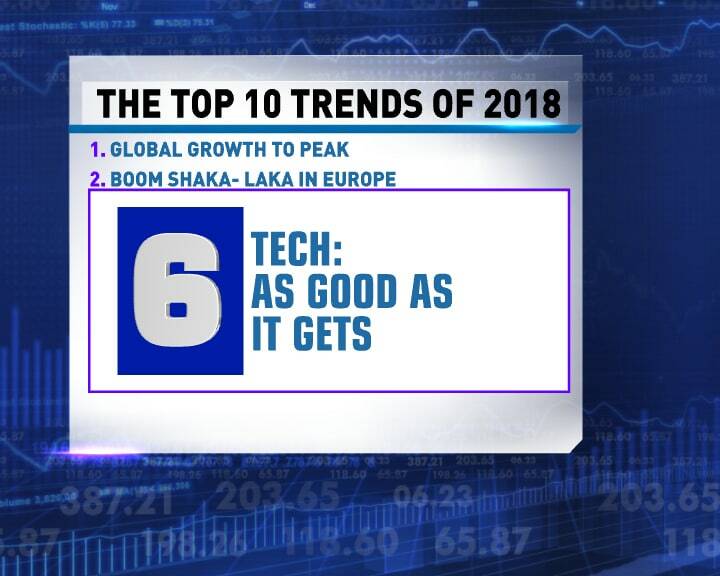 Number 6 on Ruchir Sharma's top 10 trends of last year was that tech will be as good as it gets. 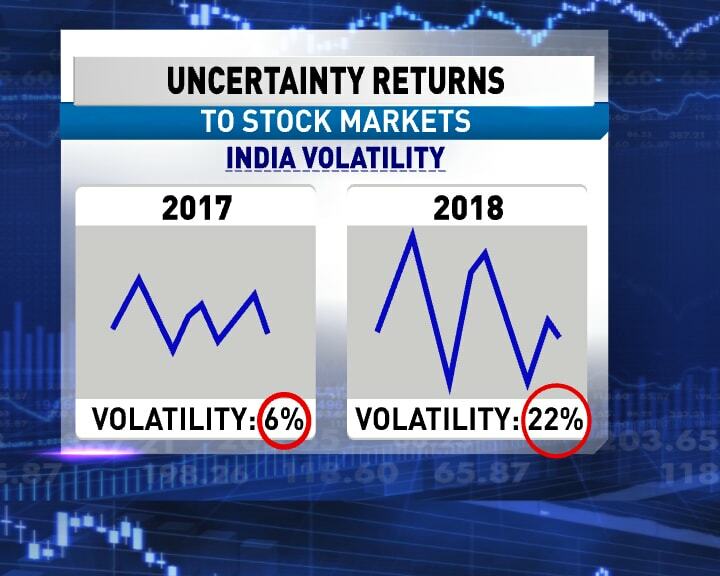 "This is just for India... but this trend is universal that in every stock market around the world, we saw much more volatility and that sort of reflects much greater uncertainty about the future prospects for growth," Ruchir Sharma says. And here's how it actually turned out to be: The drop between the high and the low was only 6% in 2017 and 22% in 2018, data shows. 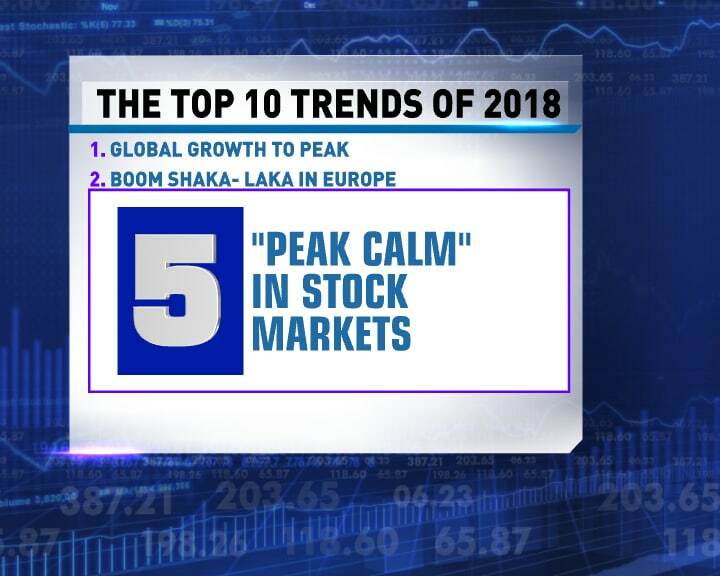 Lets look at the number 5 in the top 10 trends of last year: Ruchir Sharma said we'll have a "peak calm" at the stock markets. In other words, stock markets in 2017 were very calm, they didn't, they weren't very volatile and he said that was going to be over. "There were some small markets somewhere like Qatar or somewhere which had positive returns but everywhere in dollar terms including the US had negative returns last year," Ruchir Sharma says. "I think it was the end of easy money. The federal reserve increasing interest rates led to a lot of bubbles bursting," Ruchir Sharma says. "One we haven't shown because it couldn't quite fit onto this graph because the scale was so huge, it was the bitcoin bubble. During this time last year, there was so much hype.. it is down more than 70 per cent over the last 12 months," he says. "One fascinating statistic here is that there was not one major stock market in the world which in 2018 generated a positive return in dollar terms," he says. 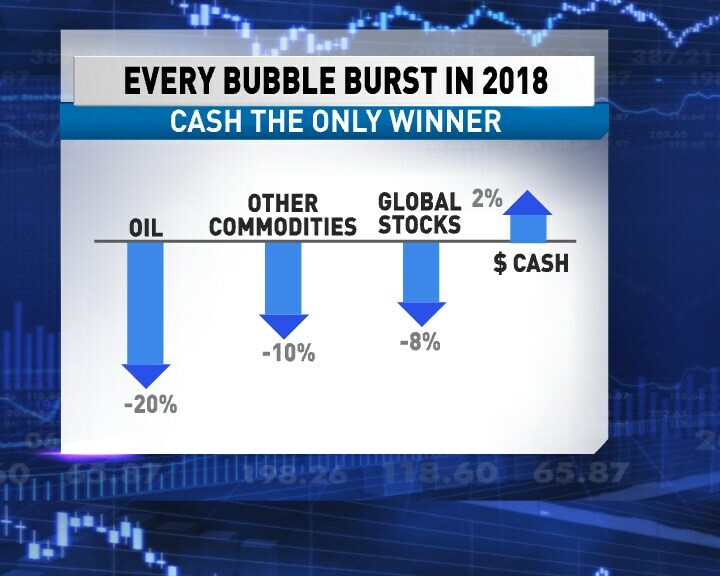 Every bubble burst in 2018. Only cash was the winner. Oil down went 20 per cent, other commodities down 10 per cent, global stocks down 8 per cent and cash up 2 per cent. Lets have a look at top trend No. 4 of 2018: That everything is a bubble. Last year, we had a bit of a relapse of economic growth in many parts of the world yet approval ratings ticked up a bit. Also, many new leaders came on to the surface and those new leaders are enjoying some sort of a honeymoon," Ruchir Sharma says. "There are so many influences now that what really leads to leaders being popular is so hard to gauge. And I think why we saw this bump up in approval ratings is also something which is mystifying but the basic connection is that in 2017 you had a booming global economy, record low rating of approvals of leaders," Ruchir Sharma says. There were few people with high approval ratings. 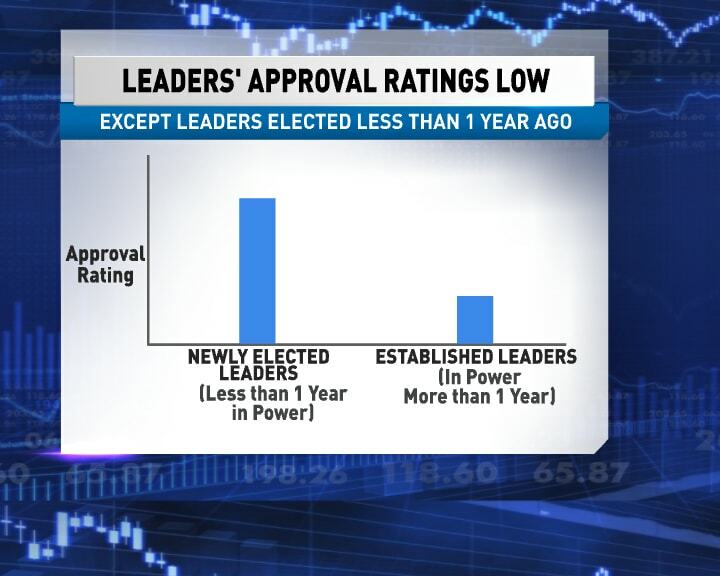 Leaders of 20 major democracies had low ratings when the economy was on a high and in 2018 these approval ratings went up when the economies were down. Lets have a look at the third of the top ten trends of 2018: Ruchir Sharma said that there are going to be a lot of indicators that good economics might not be good politics. "Well, Europe also disappointed. So I mean this is something that comes to you as surprise as you know because in 2017 we were finally seeing some signs that finally the sick continent, which has suffered two recessions in the space of a decade, was breaking out from its long slumber but unfortunately even Europe in 2018 disappointed... and I think that was one of the big surprises as far as I was concerned," Ruchir Sharma says. 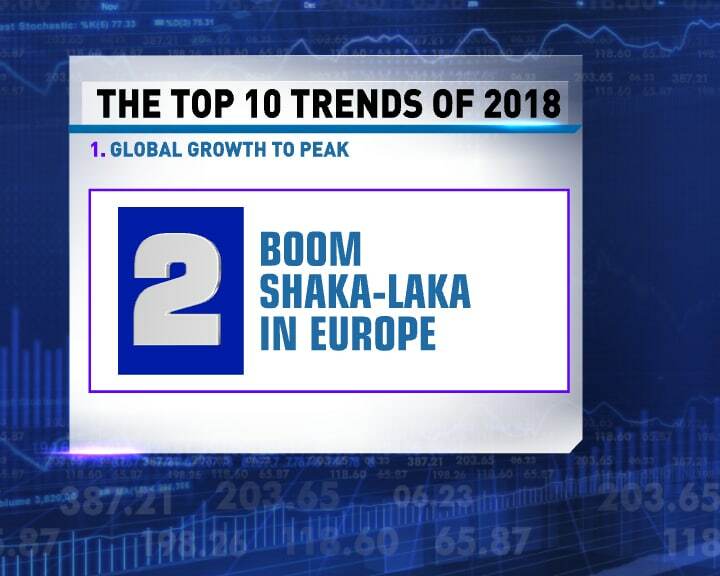 Lets have a look at what was expected to be second in the top 10 trends of 2018: That it was going to be a year of "Boom Shaka Laka" in Europe. "The markets have been getting quite nervous across the world that in the last few weeks that... the United States with is also now showing signs of slowing down," Ruchir Sharma says. Ruchir Sharma explains why that happened. "I think that this has been a sort of surprising development in the last 12 months with every economy in the world - with the exception of the Unites States - has decelerated. I think there are some structural and some cyclical reasons for it. Then interest rates have been going up across the world, global trade has been slowing down, there is a lot of uncertainty because of the global trade battles that are going on between USA and China which we will speak about during the course of this show. And also the fact that you have demographics which are turning against the world with the large chunk of the world's population which is ageing," he says. The first top trend was that global growth will peak in 2017-18. 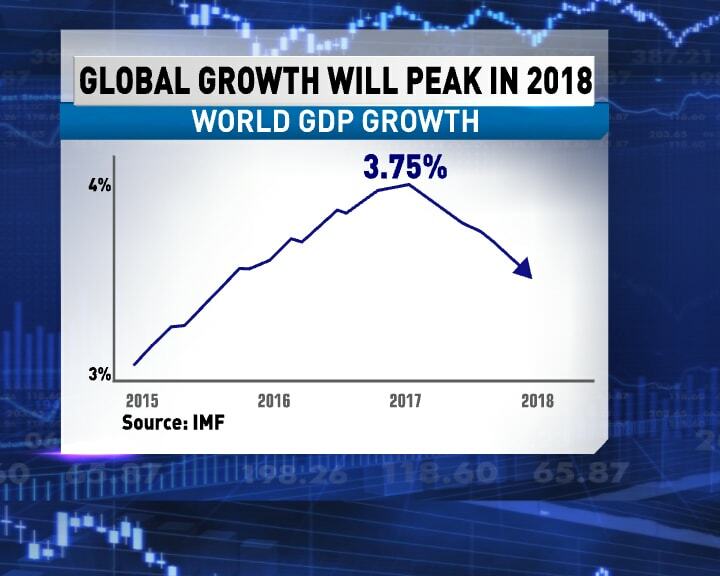 Data shows that global growth in 2018 actually hit 3.75% and then it did come down. 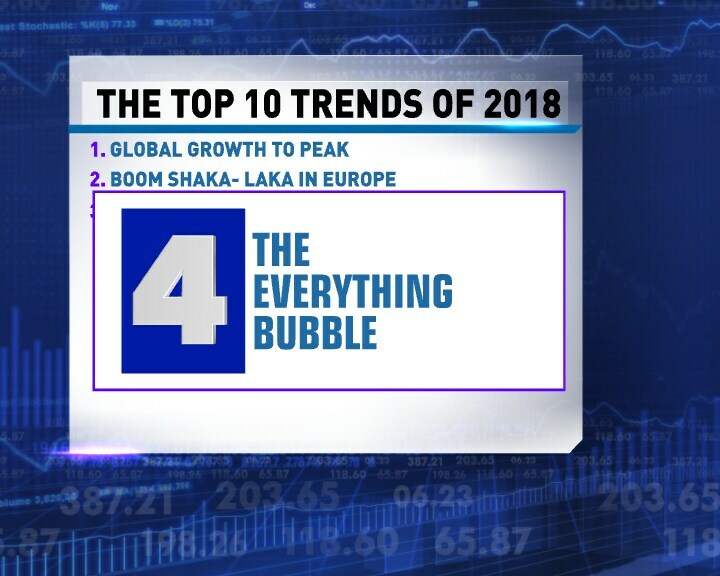 First, here's a recap of the trends that Ruchir Sharma predicted we would see in 2018.